Picture a Day - The Holy Land Revealed: Mystery Rabbi at the American ConsulateGetting a Little Closer to Identifying Him. Can You Help? Getting a Little Closer to Identifying Him. Can You Help? ﻿The Library of Congress photograph collection contains many mystery photos. Captions are often wrong or just plain missing. That's not surprising considering that the 22,000 photos took a very circuitous journey from the American Colony Photographic Department to the basement of the YMCA in Jerusalem, to the United States and a California old age home, to the Library of Congress in the 1970s and eventually to the Library's digitalized library online. This blog has been able to solve some of the photographic enigmas. So we looked at the picture above as a new challenge. While the American seal is evident above the door on the left, there is no information about the group's identity or the year the picture was taken. The only data provided was that the picture, now badly deteriorated, was taken between 1898 and 1946. But a search of the Library digital files uncovered a second file, also deteriorated and with a broad range of dates, but with a name in the caption: "Heiser (sic), American Consul, fourth from left." ﻿Presumably, that's Oscar S. Heizer who served as Consul General in Jerusalem between 1923 and 1928. Heizer held important diplomatic positions in the Middle East at the beginning of the 20th century, including consul in Trebizond, Turkey in 1915 from where he reported on Ottoman atrocities against Armenians in letters to the American ambassador in Constantinople, Henry Morgenthau. 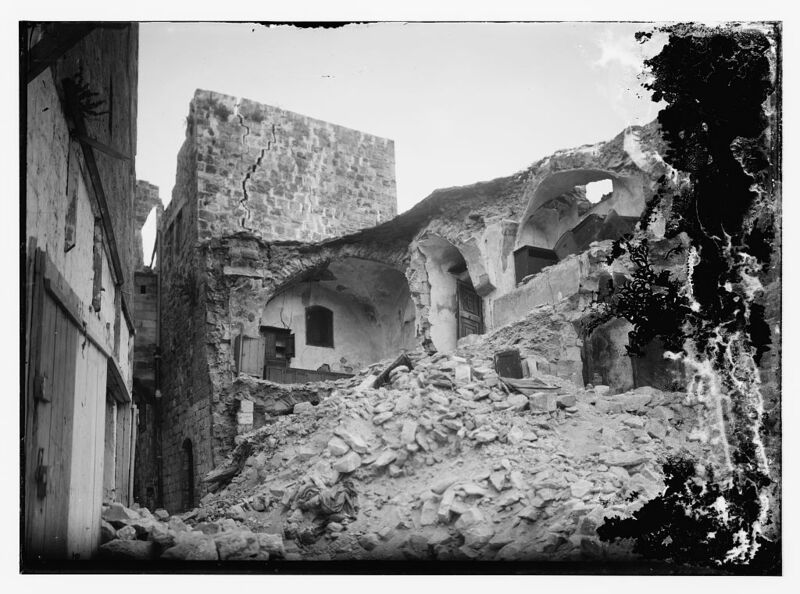 ﻿﻿In July 1927, Heizer sent cables reporting on the wide devastation in Palestine caused by a major earthquake. One of cables listed the casualties: "Twenty-five were killed and 38 injured in the Jerusalem district, At Ramleh-19 killed, 28 wounded. At Nablus-15 killed, 250 wounded. At Ramallah District-3 killed. At Hebron-3 killed." So now we have the name and dates of the American consul-general. But who is the rabbi, who, we suspect from his well-tailored suit, was visiting from the United States sometime between 1923 and 1928? Was he involved in distribution of charity funds to the "Old Yishuv" in Palestine? During World War I, the American consulate played a very important role in distributing the "Haluka" funds, bypassing rapacious Turkish officials. I appreciate getting a relative close-up of the rabbi in question ... but what photo is that close-up from?? 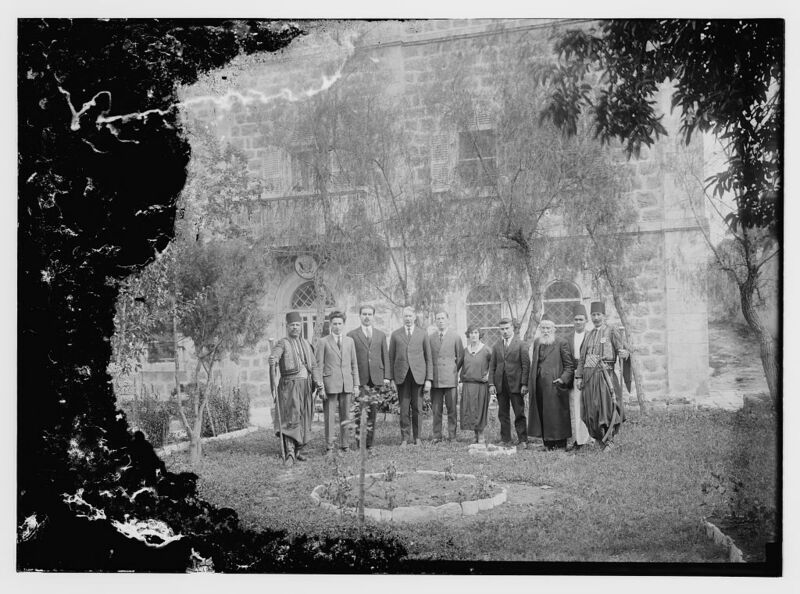 Notice that the (apparently same) rabbi in the group photo is standing mostly in front of a window, and there is a tree trunk just to the left of his face. In the close-up he is standing mostly in front of a wall, with a window to the left of his face. The windows in the two photos appear to be the same, and the rabbis may be the same man, but perhaps not.